While cleaning and reorganizing the Main Street Gazette’s office I came across this great picture taken in, what I believe was, December 1997. 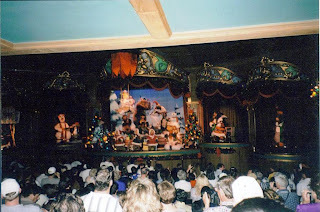 From the finale of The Country Bear Christmas Special, a paw tapping version of the Country Bear Jamboree that ran in the place of The Country Bear Jamboree. The Special ran from 1984 until 2005 during the winter season. Rumors of the shows imminent return seem to gather every autumn, Henry and the gang have not donned their gay apparel for the past three years. I do love the Country Bear Jamboree at Christmas, and I really hope they bring it back again. I only managed to see it the once, but it really left an impression on me! And what a fantastic photo - I love coming across old Disney snaps! Thanks Ryan!